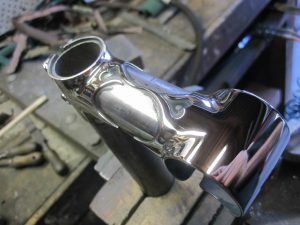 Browse: Home / 2017 / December / 01 / Part 8 Casting # 1 The Llewellyn Stem lug set. 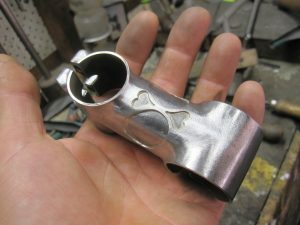 The sketches of my stem lug desires commenced, I had chats with Kirk Pacenti and a few others about how to go about this project and seeking a foundry to do the investment castings. 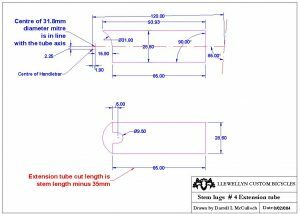 I had started self-teaching myself via text books in the evenings the basics of 2D CAD drawing and I generated some 2D CAD drawings of the determining dimensions of the lugs. 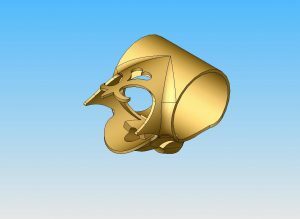 I also contacted investment casting foundries in Australia to consider casting the lugs however when I showed them the drawings they said it cannot be done with such thin walls at 1.20mm. 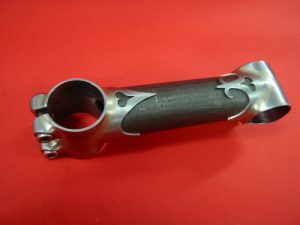 I showed them bike frame lugs castings with 1.20mm walls from Taiwan. That had them standing on their batting crease as if Shane Wayne had bowled around their pads an unplayable delivery that spun and fizzed off the pitch to rattle their stumps. (think of the famous first Test delivery to Gatting) The huge amount of time this project sucked up is immense. It filled a significant part of many days and many evenings and I still had to make frames to fill the orders and earn a $ to live with and also to finance this casting folly so working weekends was required. I would have made more $ if I spent that time filling the supermarket shelves at night but of course, the motivation was to make the vision or dream folly a reality, even if it was just once in my life. It was all to be part of my journey and part of my time line. The drawings evolved and I made the decision to go off shore to Taiwan for the foundry. LongShen have been doing a large share of the steel frame building world’s casting for some time and a few of my colleagues had recently had them successfully involved with their projects. The internet made all these communications much easier than in the decades before and the sharing of info was much increased compared to the 1980’s. Crikey, the silicon chip has moved the world and bicycle frame building was a tiny part of it all. 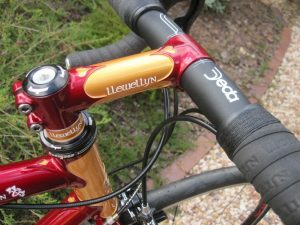 The fork lug to also fit 1” (25.4mm) with an alloy sleeve such as the one Deda Elementi make. 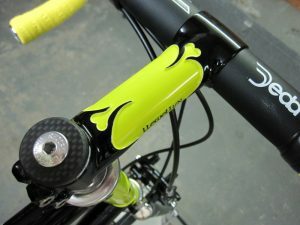 The handle bar lug to fit 31.8mm handle bars. 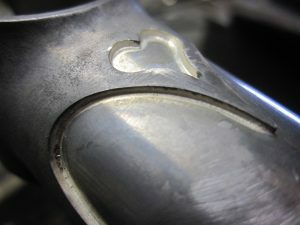 To use a round 28.6mm extension tube for adequate strength and to match the top tube diameter. 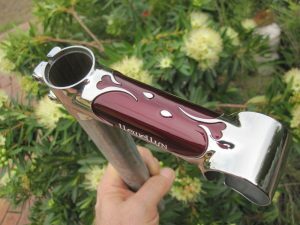 Easy mitring of the 28.6 diameter extension tube and easy perpendicular alignment of the handlebar axis to fork steerer axis. 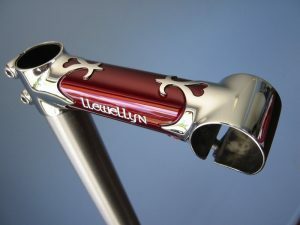 Single M6 bolt was chosen for the bar clamp, because the stem is made to length for the bespoke fitting bike and not about seeking a position off a bike shop floor size. Also the aesthetic was to be sweeter and less material required. Room on the lugs shore line for the builder to alter to compliment the frame’s lug shapes. 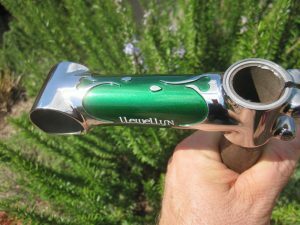 The lugs would only be cast in stainless steel to avoid corrosion with interface of the handle bar and fork. 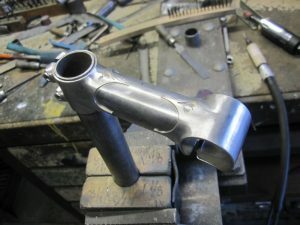 I fabricated a sample of the bar and fork lug from machined tube and stock material along with some brazing and shaping. 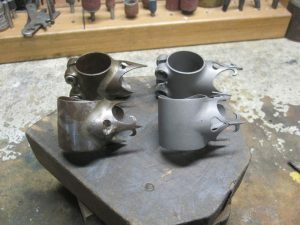 These fabricated samples I still have and the picture is of them alongside the finished cast parts from Longshen. 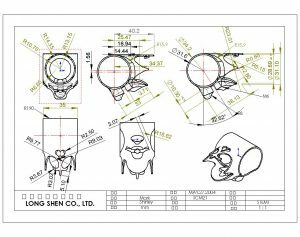 The samples were sent to Longshen and they have a draftsperson do the working 3D drawings from the samples. 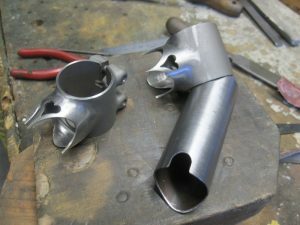 The parts were complicated and a lot back and forth was required to get the design sorted. At the time I was learning a lot about the process and language and communications was troublesome but it was all sorted out, mostly with evening emails. 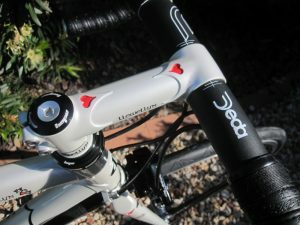 The first samples arrived and from August 2004 I and others have been making lugged stems with these lugs. 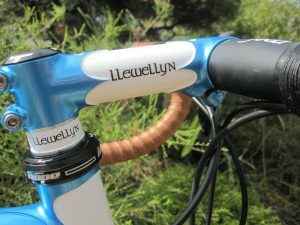 However I wish to remind the reader that I do not design and produce these parts or any other frame making parts to tap into a perceived market need of other frame builders. 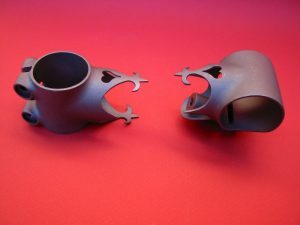 I design and produce the parts for my own in-house production first, because the parts do not exist or maybe the existing parts have shortcomings. 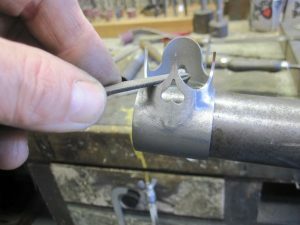 I make my living from my hands, so to justify financing the expensive tooling, which was done by borrowing on the equity of the home I then sell the parts to other builders directly or via my agent in the UK and an agent in the USA. It takes about 3-6 years to break even on a part again after the financing interest % is calculated and then one can make a meagre return. 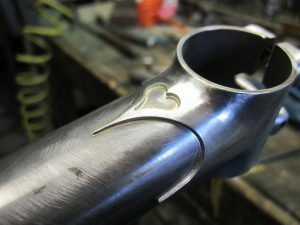 So I happily make stems for the 99% of the Llewellyn owners and over the years I have had many Colnago owners ask me to make a stem for them to fit to their Colnago, I tell them as Ernesto cannot supply you a decent stem to match your bike I will happily make a stem for you and I give them the quoted price, which happens to include a painted Llewellyn Frame and fork ? ← Part 7 The Llewellyn frame casting story.